Edmunds projects GM, Ford and FCA all will increase market share in October. U.S. new-vehicle sales are on pace to reach the highest level for any October since 2001, according to three forecasts. One of the forecasters, LMC Automotive, also raised its full-year outlook to 17.3 million vehicles, which would be just shy of the industry’s single-year record. October 2001 was one of the industry’s strongest months ever, amid widespread zero-percent financing offers designed to stimulate sales after the 9/11 terrorist attacks. Sales topped 1.7 million units as a result. LMC today projected October sales of 1.38 million vehicles, a gain of 8 percent from October 2014. Edmunds.com said it expects sales to rise 12 percent, to 1.42 million. Wells Fargo analyst Richard Kwas also said sales could exceed 1.4 million. The industry’s best year ever was 2000, when automakers sold 17.402 million cars and trucks. TrueCar recently upped its forecast for 2015 to 17.4 million units, a 5.3 percent increase from last year’s total of 16.5 million. TrueCar also said revenue from new-vehicle sales is rising even faster, projecting a record of $565 billion for the year, 7.2 percent more than in 2014. October’s seasonally adjusted, annualized selling rate is expected to be down from 18.2 million in September but still one of the year’s highest. LMC estimates the SAAR at 17.4 million, while Edmunds is calling for 17.8 million. If the Edmunds forecast is accurate, it would be the first time that the industry has achieved a SAAR of at least 17.8 million for three consecutive months since January through March 2000. The SAAR was 16.5 million in October 2014. J.D. Power, which works with LMC to develop its forecast, said retail sales are up 7 percent in October from a year ago. “September was a strong month -- bolstered by the Labor Day weekend -- so the expectation is that we would see some weakness in subsequent months, but that hasn’t been the case,” John Humphrey, senior vice president of the global automotive practice at J.D. Power, said in the companies’ statement. J.D. Power projected a 15 percent gain in truck sales and a 2.6 percent decline in car sales for October, even though incentives on cars are averaging $650 more than trucks. 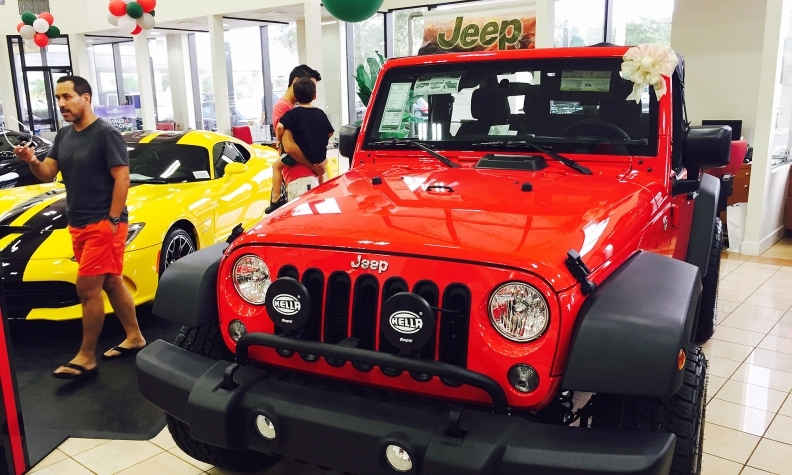 It said pickups and SUVs accounted for 58 percent of retail sales in the first half of the month. Edmunds said it expects Volkswagen Group of America sales to rise a combined 5.1 percent in October, despite the scandal over illegal emissions from its diesel vehicles that emerged in mid-September. It said the VW brand would be flat, while Audi extends its streak of gains to 72 consecutive months with a 15 percent increase. Edmunds projects General Motors, Ford Motor Co. and Fiat Chrysler Automobiles all will increase market share in October, while Toyota Motor Sales U.S.A., American Honda and Nissan North America will lose share. “The early signs for October again look to be very positive,” GM North America President Alan Batey said this week.